You take the good, you take the bad, you take them both and there you have: The Facts Of Life: The Complete Series ! On January 13th, 2015, Mrs. Garrett and her girls are ready to make you laugh - and make you think - all over again with Shout! Factory's release of the beloved sitcom as a complete series DVD set for the first time! 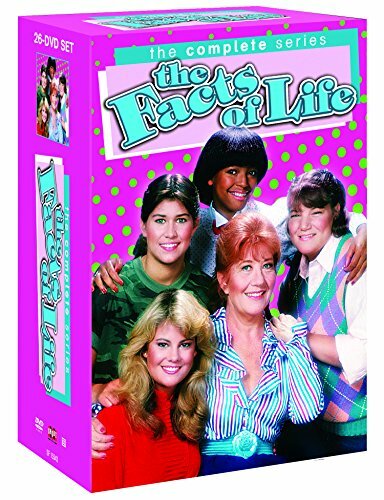 The Facts Of Life: The Complete Series contains all 201 episodes of this quintessential 80s show as originally aired, as well as a disc of bonus features including the new-to-DVD 2014 Paley Center cast reunion event! Fans who order the 26-DVD set through ShoutFactory.com will receive free shipping, as well as early delivery of their sets by December 16th, 2014. Join Blair (Lisa Whelchel), Tootie (Kim Fields), Natalie (Mindy Cohn), and Jo (Nancy McKeon) at their exclusive girls school as they experience the highs and lows that we all experience on the road to adulthood. With the ever-developing friendship of our four young heroines, the gentle wisdom of Mrs. Garrett (Charlotte Rae), and enough "Very Special Episodes" to make viewers blush, The Facts of Life remains a favorite for countless fans to this day. From Eastland School for Girls to Edna's Edibles...from hilarious Cousin Geri (Geri Jewell) to hunky George Burnett (George Clooney), who says "the world never seems to be living up to your dreams?" Spinning off from the hit show Diff'rent Strokes, The Facts of Life debuted in August of 1979 and aired on NBC for nine seasons. Featuring guest stars including George Clooney, Cloris Leachman, Mayim Bialik, Seth Green and Juliette Lewis, the Primetime Emmy(R) nominated series went on to becomes one of the longest running sitcoms of all time and is firmly entrenched in 80's pop culture.